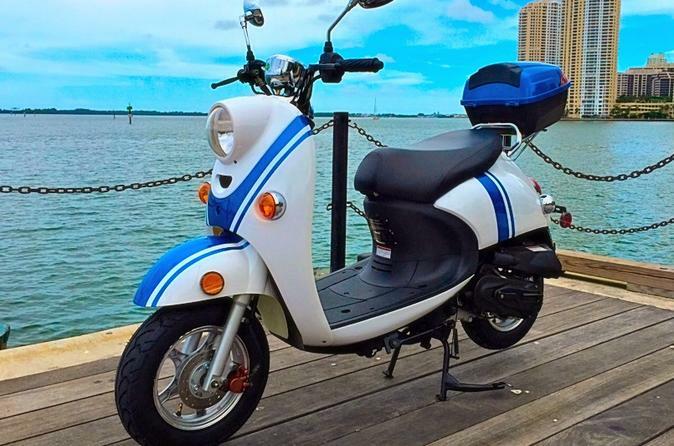 Take in the sights and sounds of Miami with this handy scooter rental. Scooter rentals are part of the Magic City experience and this convenient and hassle-free rental will help with touring the town. Simply choose the length of the rental — from two hours to a full week — and set out to explore all the city has to offer, from the beach walk to the Art Deco District and all the attractions in South Beach. Roadside assistance, if needed, is included. Tour the city of Miami at any pace desired with this convenient scooter rental. Select the number of days — from a couple hours to a week — and set off on an adventure through the Magic City. Rentals are available for half day, full day, weekly or monthly. Visit the popular Art Deco District, the first 20th-century neighborhood to be recognized by the National Register of Historic Places. Buzz around the Miami Beach Boardwalk, Beach Walk, and/or Bay Walk. Then hit up some of the many attractions in 'the American Riviera,' South Beach. Please note: there is a $200 security deposit required per scooter, which will be returned after the rental period — provided there is no damage to the vehicle. The minimum age is 18 years old with a valid driver's license.